There are many reasons why your root canal needs to be redone and with this post I will address one reason. Probably the most common reason I encounter is an extra missed canal. Before I begin I want to make it very clear that these are not always easy to find or treat. Sometimes I know there is one there and I drill down a root trying to treat the canal. Eventually I have to weigh the risks of drilling down a root with the risks of leaving the canal untreated. 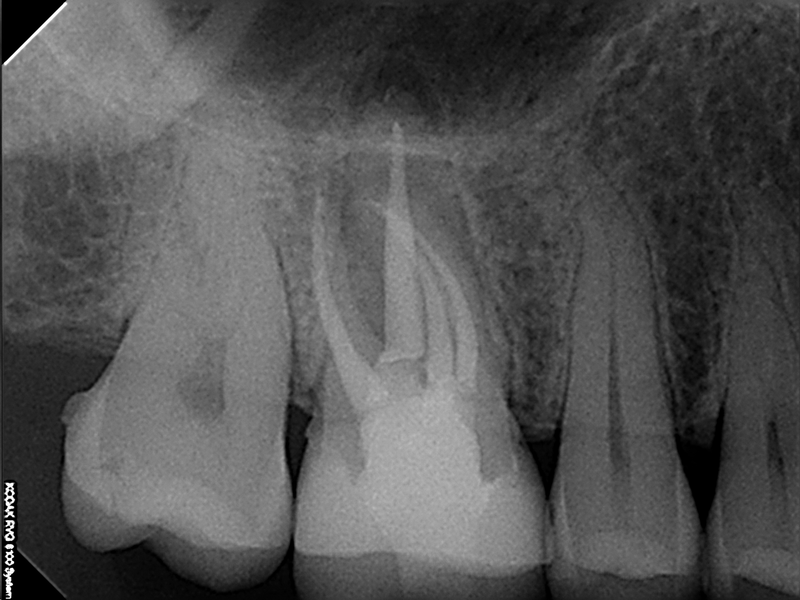 Luckily root canals are very successful and most of the time they work well even if we can't get down the root, but I love to find and treat these extra canals. It is challenging and fun. Now onto the images above. This is a radiograph (or x-ray) of a tooth with a root canal. The first image was how it presented. 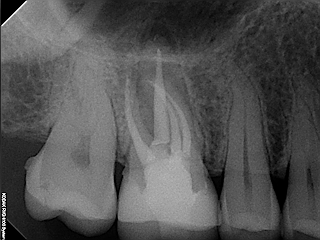 The patient had an abscess or pimple on the gums next to the tooth. This is simply a path for infection to drain from the root tip out of the bone. If you look at the first image you can see 3 canals that were treated. The canal on the right is inside a root we call the MB root. MB stands for mesial buccal or toward the midline and toward the cheek because this root is oriented toward the midline of the teeth and toward the cheek relative to the entire tooth. This is the root that tends to have more than one canal. We call the canals MB1 and MB2 because they are both located in the MB root. 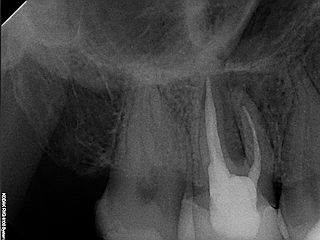 In the second image you can see after we retreated the tooth and located the second canal or MB2. The pimple healed and the tooth has felt better since cleaning the bacteria out of the second MB canal. So does your tooth have an "extra" canal. It is hard to say because there is so much variability with teeth. Some upper molars have one canal, some two, most have three or four and occasionally they can have more than four. So I always look for four and expect to find four or more. If you have a question concerning your upper molar or root canal visit our website www.baumanendo.com or call our office at 801-793-8822 for more information. Is this an Xray of someone I know? :) Story sounds very familiar! Haha. Thanks for this blog... very interesting! You know I love learning about this stuff. Root CanalBroadway Family Dentistry has been giving dental watch over inhabitants in the Orange County territory for final twenty three years. We are conferred to enhancing your wellness with exhaustive dentistry being a key part of your health.